You guys sure had a scenic vacation, it was good for the boys to see the country. Rain again today, I think we have had enough. Off to Lincoln to see the big building? "Capital suggestion," as the British might say. Are you Planing to get to all 50 state capitals? Great pic of the guys! Never been to Austin. 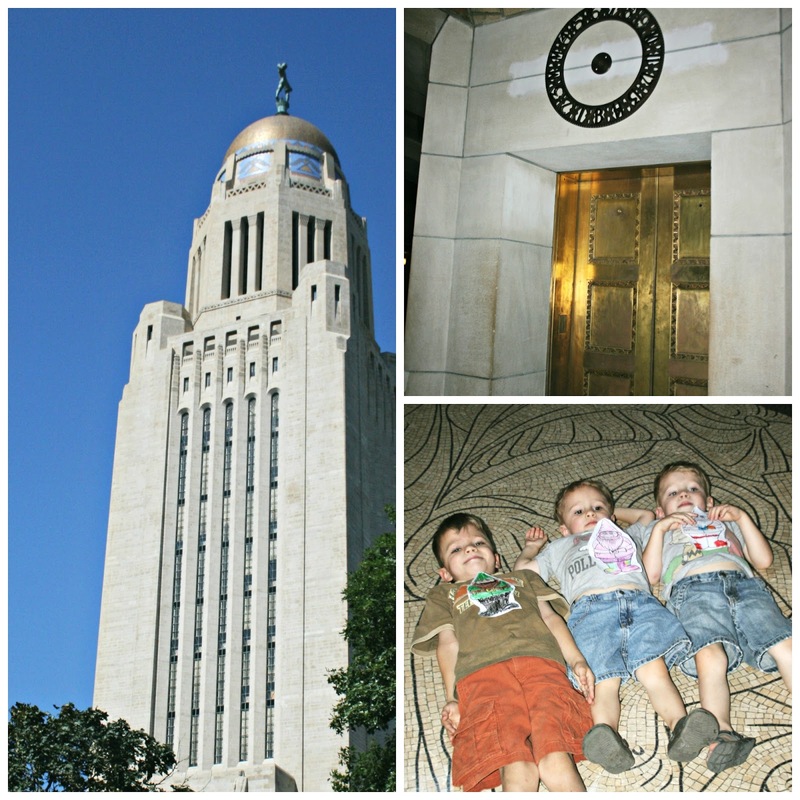 And I have not been into the Capitol in Topeka for decades...maybe I will haul our Monkeys there next time we visit Grandma. Thanks for the idea! That must have been a great panorama from up there! that's cool that pierce wanted to see it. I remember learning the State Capitals! That was fun. That sounds like a fun day all around. When those boys hit their teenaged years, you and your husband are going to have your hands full. My mother had three boys spaced a year between each. I've always wondered how she made it through our teens alive. That's great that Pierce can now have a visual of one of the capitals he's learning. Love the photo of the boys with the gnomes! Can you believe it--I've never toured the capital of Virginia? Have a wonderful time with Paul's family. Love the picture of the boys on the floor. I don't think I have ever been in a state capitol building!! Wow, is that a gold elevator? Yep we've been there. It's a really pretty building! That's so good to hear about Pierce! I'm not surprised though. He's a smart little dude! Sounds like a great place to take your sons. I can understand the interest Pierce has in this subject. Its great to share such adventures with your children. Very educational. What a great opportunity for the boys. I enjoyed your photos very much. What a lovely little visit for your family. I've not been to Nebraska....and it is a state we want to see one day. Love seeing it through your eyes! I've never been to my state capital, ever! Looks like you and the boys had a grand time.